Dhokla used to be my go to snack few years ago when I would steam an instant dhokla every other day. It was always for our evening tea or when my brother came who loves dhokla. And then our evening tea changed as we started having early dinners. So the evening tea was just tea and nothing else with it most of the times. 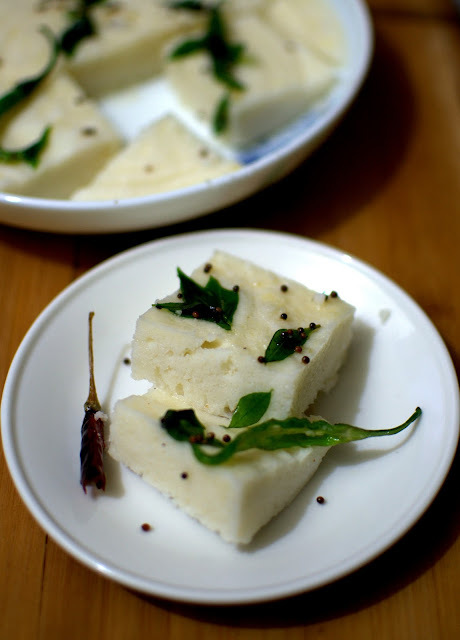 This recipe of sama ka dhokla was suggested casually by a senior of mine during my research days and I used to be my experimental best regarding cooking in those days. So I played with this idea of a recipe and made a significant change. Instead of using whole sama ke chawal as suggested by her, I made it into a batter and the dhokla turned out much better. I like the sama ki idli steamed with whole soaked millet. Soak the millets in the buttermilk and salt overnight, but keep it refrigerated if you are using sour curd in summers, it could get too sour for your liking. 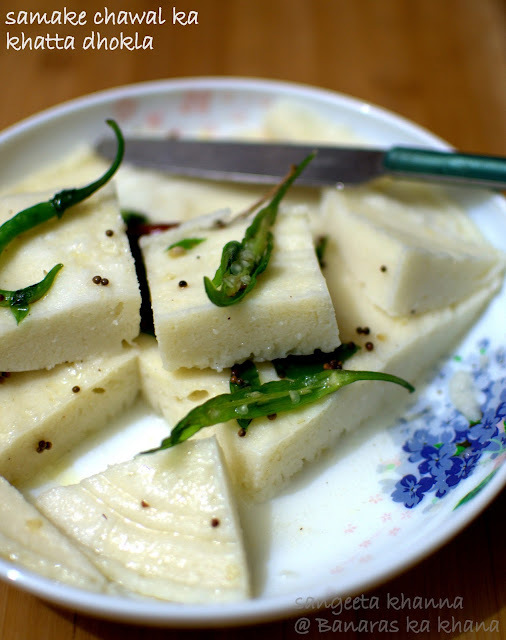 But if you like khatta dhokla, you would like it really sour. Go with what you like. Also, this soaked mixture can be refrigerated for up to week if you are a bad planner. It happened with me so I thought I should add it to your convenience. Make a batter of the soaked millet by blending it in mixie or food processor when you are about to steam the dhokla. Add 1/2 tsp pf soda bi carb to the batter, mix well and pour into a greased plate or steaming vessel. Steam till set and cooked. I used an opal ware plate and microwaved it for 5 minutes covered with a dome lid. Let it cool completely. Then cut in desired shapes. For the tempering, heat oil in a pan, tip in the hing and rai seeds and let them crackle. Add the chilies and curry leaves and stir them to let them cook and release their aroma. Pour water and add the sugar, let it come to a soft boil. 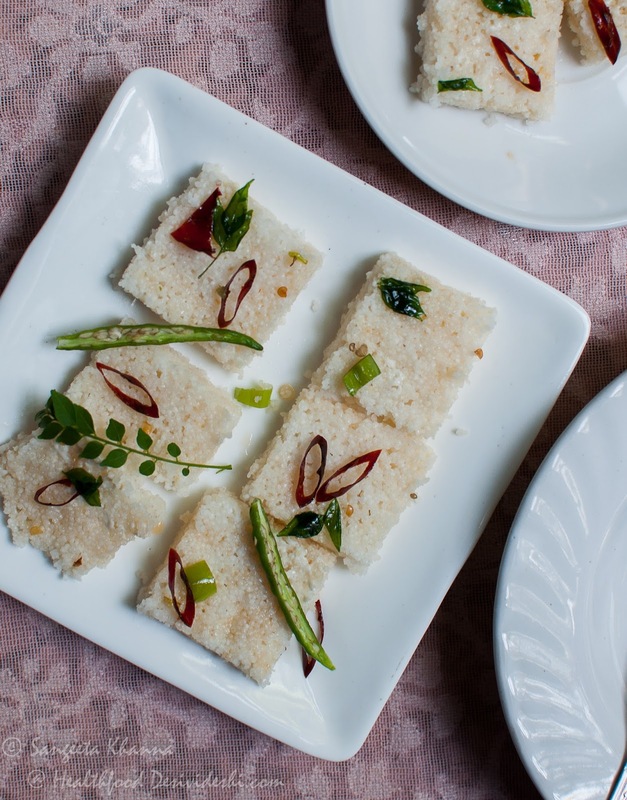 Take off the heat, add the lime juice and pour over the steamed dhokla. Let the sweet and sour water soak in, it will all disappear within 5 minutes. The dhokla will swell up so make space for them by removing a few from the plate. Soft and spongy, hot, sour and lightly sweet and completely bursting with flavors of the tempering. This makes a very pleasant snack or meal, or part of an elaborate meal. You just can't stop at a couple of these. This millet has a nice nuttiness to it when cooked and that comes out really nice with this dhokla tempering. Those fried and then boiled chilies become so yummy I gobble them all up. We had it with our evening chai as I mentioned. 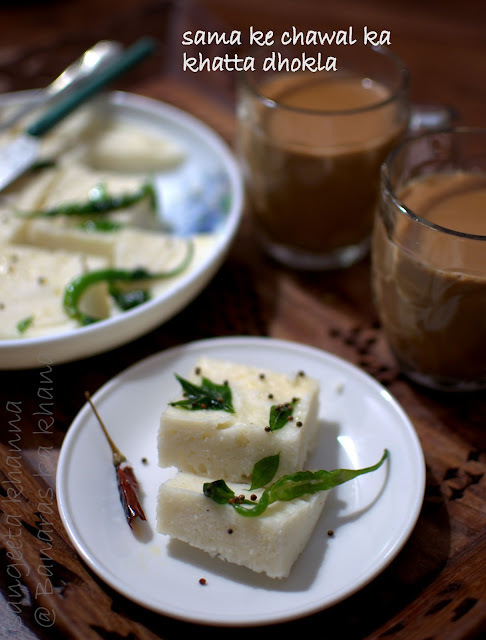 But the chai was given a royal ignore as the dhokla took center stage I had to reheat the chai later to finish it. The dhokla is that good. Vrat ka khana or fasting food can be fun if you use the ingredients to full potential. I keep cooking these ingredients whenever possible as all alternate grains do taste great and provide a good opportunity to bring variety to my meals every day. Hey..who needs to fast when you have the liberty to eat whatever you want as it is...whenever you like. I am sure you would love it Amrita. Hi Sangeeta , I never fast but my husband does and for him I make all kinds of healthy dishes....This is different and will definitely try soon . Thanx for sharing .